With a routine, outpatient surgical procedure, an ophthalmologist can remove the cataract, making either a small incision (phacoemulsification) or a larger incision (extracapsular extraction). 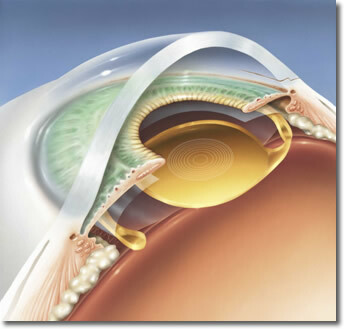 Usually, a synthetic intraocular lens (IOL) is inserted at the time of cataract extraction to replace the focusing power of the natural lens. IOLs can be monovision (fixed-focus for a preset distance) or multifocal, which allows focused vision at many distances. The time to have cataract surgery is when the cataract is affecting your vision enough to interfere with your normal lifestyle. Call our office today to make an appointment for a cataract evaluation. Expect to be dialted for your first consult. This will allow Dr. Lawrence Hopp to give the patient a thorough and go over his findings and recommendations.